Caught between a rock and a hard place, the Vijay Rupani-led BJP government in Gujarat has ended up tying itself in knots over the just-concluded indefinite fast of Patidar quota stir leader Hardik Patel. The protest fast, which began on August 25, saw the youth leader enlarge his demands to include farmers’ debt waiver and emerge as a bridgehead for the national opposition, BJP rebels, even garnering support from NDA ally, Shiv Sena. He gave up his indefinite fast on the 19th day on September 12, 2018 but not before he brought divergent sects of his community on a common platform in a show of unheralded unity. Present on the occasion of his fast breaking were key leaders of the major sub-castes of Patidars, not very often seen on a common community platform. As the reverberations from his stir spread out in concentric circles countrywide, the BJP was at it’s wits end dealing with the political fall-out of a 25-year old’s intransigence, which has caught the imagination of not only his own community and their youth, but also of others countrywide. The tension was palpable -- both within the government as well as his own caste formations -- on August 7, when he was rushed to hospital after he complained of breathlessness and reports of supportive protest demonstrations poured in from various parts of the state, particularly Saurashtra region which is the cradle of farmer unrest in Gujarat. A day earlier, he had even given up drinking water. The government put together a team of 10 doctors to attend to a man whom the very same government has charged with sedition! Though a sense of bravado marked the official reaction of the BJP government in the state, the ‘posturing’ was in sharp contrast to the hawk-like vigil that the state officialdom had been asked to maintain. Gujarat minister Saurabh Patel went on record to state that politics in the name of caste goupings (samaj) must end, but chief minister Vjiay Rupani, before he left for Delhi to attend his party’s national meet, had already put in place a three-minister informal panel to deal with the situation. The three ministers, Kaushik Patel, Bhupendrasinh Chudasma and Pradipsinh Jadeja, had recently held a meeting with representatives of six Patidar organizations. An underlying thread of tension ran strong, both within the ruling political establishment as well as without, over the fall-out of the indefinite fast. Hardik all along remained defiant. He was persuaded by Loktantrik Janata Dal leader Sharad Yadav to start taking water. Said Hardik, "The BJP government is ignoring the demands of the farmers and the patidars at it’s own peril.” He knows best, because it was the BJP’s foolhardiness that created Hardik. And, he will be the biggest thorn in their side, countrywide, in the years to come! There has been a lot of hectic activity with community leaders mediating between the Patidar Ananmat Andolan Samiti (PAAS) and the state government. Both the community big-wigs and the government knew that there would be a major law and order problem, if something happens to the youth leader. The ruling party is learnt to have pressed panic buttons after it came to be known that Rahul Gandhi may come calling on Hardik. 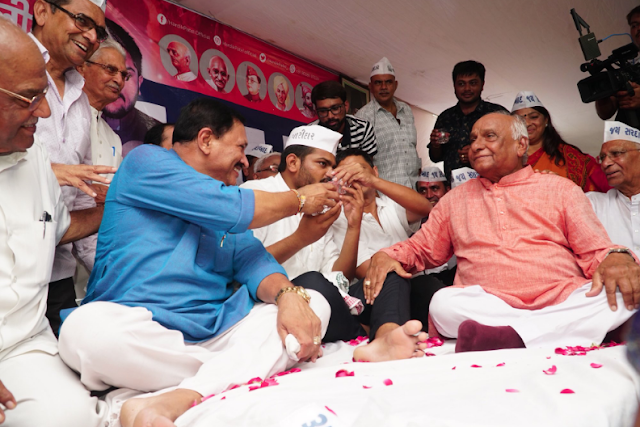 The spearhead of agitational politics in Gujarat has been on the warpath since 2015 single-mindedly pursuing his goal of reservations for his community in government jobs and educational institutions. He has now widened the ambit of his protestations to demand debt waiver for farmers of Gujarat and release of his aide, Alpesh Kathiriya, who is behind bars on charges of sedition. He has been getting bountiful support of opposition leaders countrywide who see a bridgehead for themselves and the joy of reveling in the discomforting tremors in Modiland. He received a rakhi from West Bengal chief minister Mamata Banerjee and vocal support from the Rashtiya Janata Dal, Praful Patel of the Nationalist Congress Party, Aam Aadmi Party chief minister Arvind Kejriwal, former UP chief minister Akhilesh Yadav, BJP MP and filmstar Shatrughan Sinha and former Union minister Yashwant Sinha called on him to announce support, besides A Raja of the DMK who alongwith Sharad Yadav also visited him. The Congress opposition has been extremely vocal in it’s support to the youth leader and his causes. It has reason to be. Hardik was part of the youth trio of Dalit leader Jignesh Mevani and OBC leader Alpesh Thakore, who helped Rahul Gandhi dent the BJP bastion of Gujarat in the last Gujarat Assembly elections. The Patels, a vote preserve of the BJP, stood divided and with the farmers pitching in against the ruling party as well, the BJP barely managed to scrape through with 99 seats in the 182 member House in 2017. With Lok Sabha elections due next year, Gujarat, the home state of Prime Minister Narendra Modi and party chief Amit Shah, occupies a place of strategic importance for both defender BJP and an aggressive Congress bolstered by a team of young leaders who have taken charge of the state. Leader of the Opposition in the Vidhan Sabha Paresh Dhanani and state party chief Amit Chavda are both in their forties. In 2014, BJP had bagged all the 26 Lok Sabha seats. In 2019,the Congress is determined to breach the bastion and is working to gain 12 to 14 seats. It is ironic that a party that rode to power both in Gujarat and Delhi riding astride a crest of protests is today using, means fair an foul, to stifle it. Hardik remains a case in point of BJP’s blundering arrogance. The events triggered by unleashing of berserk cops on the hapless public in the aftermath of Hardik’s August 25, 2015 rally brought the party government almost to the precipice in Gujarat last elections. The way his peaceful fast was sought to be railroaded through the use of the police, by first denying him a venue and then using cops to harass, lathi charge and forcibly prevent people from meeting him is bound to boomerang on the BJP in the 2019 polls. At 25-years of age, Hardik has all the time in the world. How much time does BJP chief Amit Shah-who wants him out of the way- actually have at the helm!